The Cimex Surface Scarifier is the perfect machine to tackle those tough jobs of removing impacted oil left on the ground, as well as grease and any debris on concrete floors. It wasn’t always easy removing rust, paint and oil build up, adhesives or foam backings that remain after a carpet removal, BUT NOW IT IS! 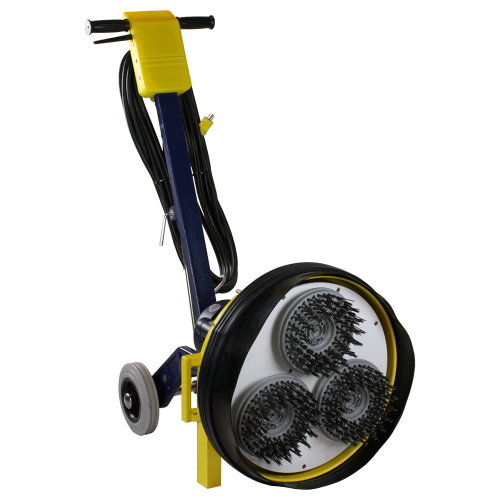 The one-of-a-kind patented counter rotating system combined with the many brushes, blades, and tools will allow you to accomplish any task that deals with extreme coating removal and scarifying scenario. This machine can take on any tough job it sees in the industrial environment. The design maintains an even scrub and constant pressure because of the motor, so you’ll never have to worry about uneven cutting or rotational scoring.